View More In Cleaning & Sanitizing - Page 4. 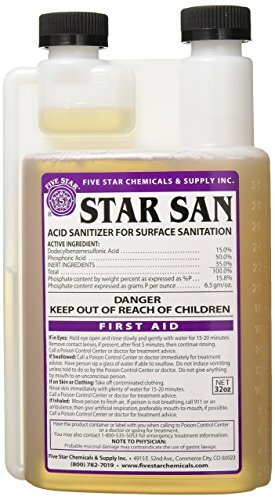 Everything you love about five Star sanitizer (Star San) but in an economical 32 oz. Container. The folks at Star San even kept the handy measuring tool built into the container making dilutions quick and easy. Star San is a go to sanitizer among home brewers, proving a true no rinse sanitation step that requires 1 minute or less. You can even place your dilutions into a spray bottle and apply directly to surfaces you want to sanitize, stretching your juice even further. Truly this stuff is a one stop shop for killing the bugs!.